1. 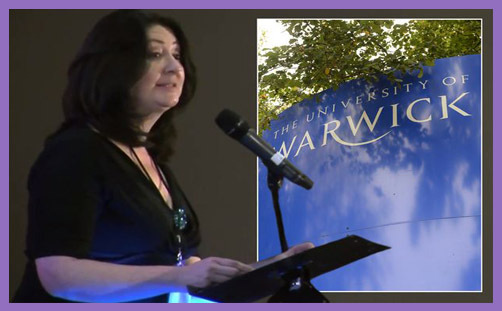 Warwick Atheists, Secularists and Humanists (WASH) applies to have Maryam Namazie – a prominent, intelligent, secularist political activist – speak at the university. ..after researching both her and her organisation, a number of flags have been raised. We have a duty of care to conduct a risk assessment for each speaker who wishes to come to campus. are not permitted to raise or gather funds for any external organisation or cause without express permission of the trustees. In addition to this, there are concerns that if we place conditions on her attendance (such as making it a member only event and having security in attendance, asking for a transcript of what she intends to say, recording the speech) she will refuse to abide by these terms as she did for Trinity College Dublin..
3. WASH appeal the decision (also reported HERE and HERE). 4. Maryam Namazie is notified of Student Union decision to veto her invitation. 5. Two weeks of silence ensues, as Warwick University Student Union fails to respond to WASH’s appeal. 6. The incident becomes public via social media all over the internet. 7. The incident becomes public via mainstream media all over the world. 8. Richard Dawkins gets wind, and alerts his 1.25million atheist/secularist/humanist Twitter horde. 9. All hell breaks loose. In reference to the external speaker request the SU has received regarding Maryam Namazie visiting Warwick SU, I feel I must clarify both mine and the SU’s position given the rather premature discussion alive on social media and in the press. As previously stated, the SU has a process for assessing the risks associated with any external speaker in accordance with our legal responsibilities. Our policy aims to provide an environment where freedom of expression and speech are protected, balanced with the need to ensure that our community is free from harm and ensure that incitement to hatred is never acceptable. However, our policy has a number of stages and – whilst risks have indeed been identified – contrary to what has been communicated in the public domain over the last 24 hours, no final decision has been taken. The responsibility for doing so is mine along with authorised senior staff members. To this point, neither I nor authorised senior staff members have had any involvement in the process – the next stage of which is that we review the request, determine what can be put in place to facilitate the event and then discuss this with the event organiser, whose role is integral to the process. We have a record of facilitating over 200 speakers a year covering a wide range of topics, many of which are controversial in nature. This is part of our role in the development of our members. We do everything in our power to ensure that these events take place, safely and with any identified risks mitigated. Declining speaker requests is an absolute last resort. I would reiterate that the process for reviewing this particular speaker event has not been completed and, once I and senior staff members have reviewed it, a further statement will be made. Given (2) and (4) above, Isaac Leigh’s assertion that “no final decision has been taken” is quite plainly a lie, as Benjamin David, President of Warwick Atheists, Secularists and Humanists, makes clear (he actually says “unpardonably misleading”, which amounts to the same thing). The Student Union position is of course nothing new. It is the predominant post-modernist “Left” point of view that conflates Islam, Muslims and Islamists, homogenises the “Muslim community”, thinks believers are one and the same as the religious-Right and sides with the Islamist narrative against its many dissenters. ..This type of politics denies universalism, sees rights as ‘western,’ justifies the suppression of women’s rights, freedoms and equality under the guise of respect for other ‘cultures’ imputing on innumerable people the most reactionary elements of culture and religion, which is that of the religious-Right. In this type of politics, the oppressor is victim, the oppressed are perpetrators of “hatred”, and any criticism is racist. These sort of Lefties have one set of progressive politics for themselves – they want gay rights, equality for women and the right to criticise the pope and the Christian-Right, and another for us. We are not worthy of the same rights and freedoms. It’s a topsy turvy world when “progressives” who are meant to be on our side take a stand with our oppressors and try to deny us the only tool we have to resist – our freedom of expression. This is not this first time; nor will it be the last. A few years ago, the London School of Economics effectively introduced a blasphemy law to protect Mohammed from satire. (1) Every individual and body of persons concerned in the government of any establishment to which this section applies shall take such steps as are reasonably practicable to ensure that freedom of speech within the law is secured for members, students and employees of the establishment and for visiting speakers. And is also illegal under Articles 9, 10, and 11 of the European Convention on Human Rights. Benjamin David needs the support of all lovers of freedom; and Warwick Atheists, Secularists and Humanists need our prayers. In the last few days we have all seen much debate, and considerable concern, expressed about an application to Warwick Students’ Union made by the Warwick Atheist, Secularist and Humanist Society, that an SU society host the campaigner and blogger Maryam Namazie as an external speaker. 1) The proper process has now been followed, as it should have been in the first place. The application by the Warwick Atheist, Secularist and Humanist Society for Warwick Students’ Union to host Maryam Namazie as an external speaker has now been considered and approved. 2) The SU is now seeking to meet promptly with the leadership of the Warwick Atheist, Secularist and Humanist Society to make the necessary arrangements for the event to take place in the format they have requested. 3) Warwick SU will issue an unequivocal apology to Maryam Namazie for this egregious and highly regrettable error. 4) Our process as to how we assess requests to host external speakers is very clear. However, it is also equally clear that how this process is communicated and understood by everyone in the SU who needs to be aware of it has failed, and failed badly in this case. We need to act immediately to examine how that happened, and to it put it right, and we will. We want to assure everyone of Warwick Students’ Union’s continued commitment to free speech. We also want to take this opportunity to apologise to everyone who has expressed concern, or disappointment, or who has been hurt by this significant error and, as we said above, we will be issuing a full and unequivocal apology to Maryam Namazie. All of which rather corroborates the previous assertion that Warwick University Student Union President Isaac Leigh is either a liar or incompetent (or both). Either way, having brought the Student Union and the name of Warwick University into disrepute, it’s hard to see how he can remain as President. But, personalities aside, it is noteworthy that the bullying / intimidatory / censorious impulse of this Student Union was defeated by Benjamin David’s tenacity, veracity and capacity to court publicity and celebrity. Exemplary culture warring. As 40% of adults think Jesus is a myth, has Religious Education failed? "I'm not sure I believe in God, but I'll take Pope Francis over Richard Dawkins any day"